This is a sponsored post. I received compensation in exchange for my work, but the opinions in this post are 100% my own. 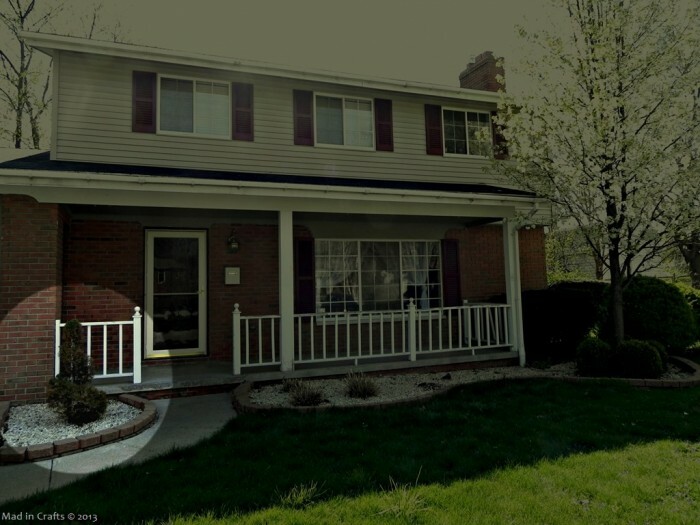 When we were house hunting last year, one of the things that first attracted us to The Mad House was its curb appeal. 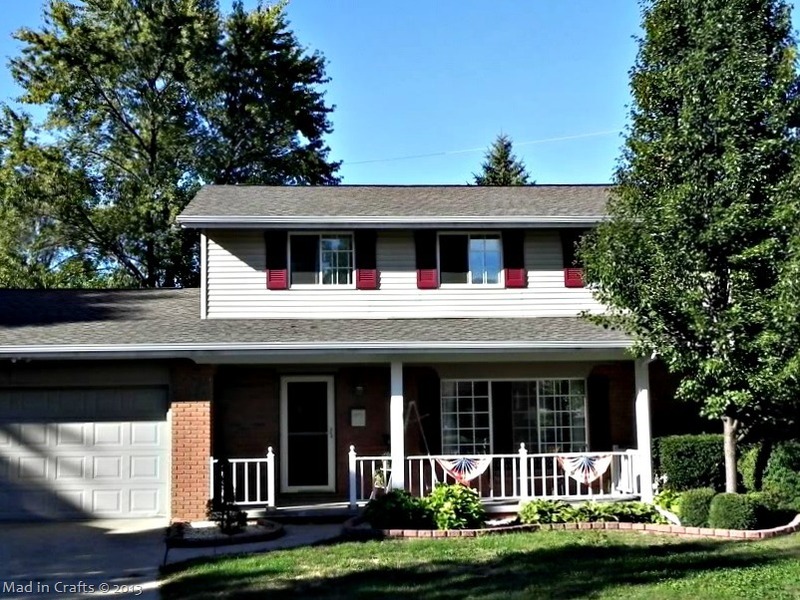 The house had nicely maintained hardscaping and smart choices in landscaping. Unfortunately, one of the shrubs was dead before we even moved into the house. Since then we have been trying to decide what kind of plant should replace it. Needs to add color to the yard. Needs to NOT grow too big (so it doesn’t encroach on the sidewalk). Needs to work with existing landscaping: hydrangeas, hostas, boxwood, flowering pear, and yews. Needs to grow well in partial sun. In order to get a better idea of what I wanted, I turned to a new, helpful gardening resource. I became a member of the HGTVGardens community. I was able to very quickly set up a profile which gives me access to the gardening community and information specially designed for my needs! 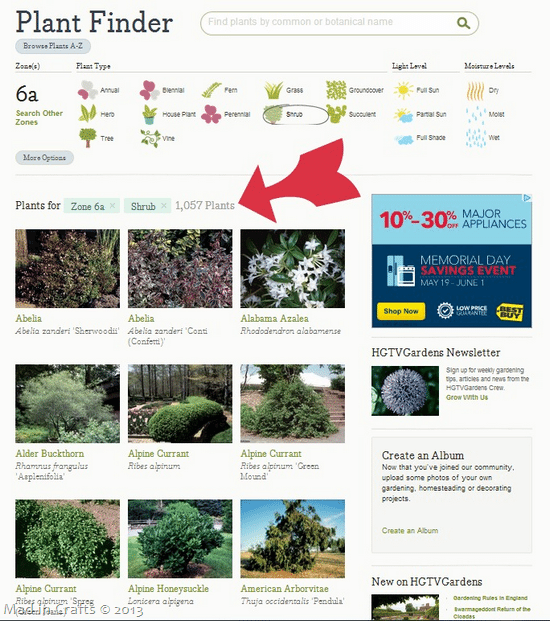 I first clicked over to the website Plant Finder. The HGTVGardens website uses the information you provide when you sign up to automatically determine your growing zone and narrow down appropriate plants for your region. Since we are looking to replace a spiral shrub, I clicked the “Shrub” icon. 1,057 results! All of them had pictures and clickable links to take me to all the growing information for each plant. I scrolled through all of them, making note of possible candidates as I did so. But I was still overwhelmed with choices, so I decided to ask more talented gardeners than I. That meant that my next stop was the Ask & Share section of the HGTVGardens website. Here you can post questions or tips to the community and get responses. 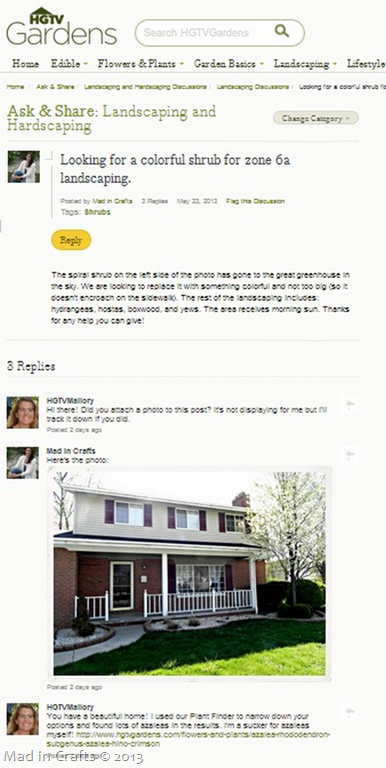 I asked my question (and eventually added a picture of the front of The Mad House) and was ASTONISHED at how quickly I had a response from a member of the HGTVGardens team! She was incredibly nice and gave me a plant suggestion with a link. Here are a few shrub options that I am considering after doing my research on the site. They all have pros and cons. 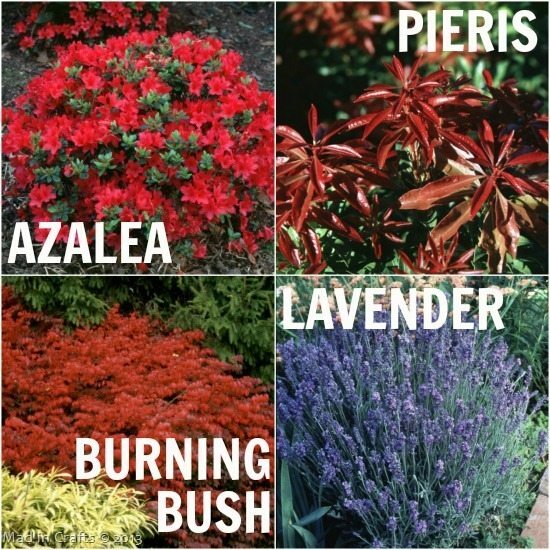 Azalea – Suggested by the HGTV team member. Gorgeous flowers. Tricky to grow? Pieris – Beautiful bright red new growth each spring. White flowers and evergreen leaves. Burning Bush – Common in the area. Turns vibrant red in the fall. Grow very large, but can be pruned. Lavender – Lovely, fragrant purple flowers. Attracts bees. 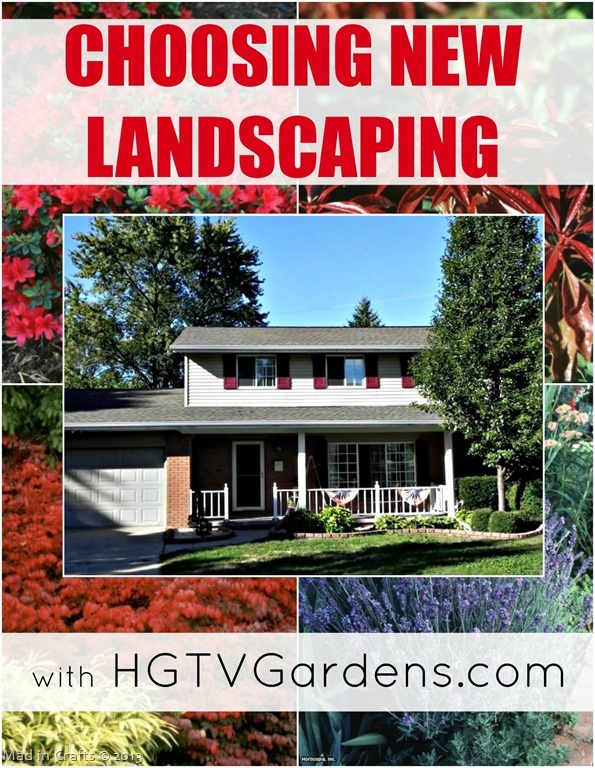 I am MUCH closer to deciding on new landscaping now that I have found HGTVGardens. Plus, I killed a bunch of time, ahem, educated myself by surfing through all the other fun information on the site, from hardscaping ideas to craft projects! Yes, craft projects! If you have any plans for your outdoor space this summer, you should check it out! SEEKING YOUR HELP!!! If you were re-landscaping that section of our front yard, what would you plant? Let me know below. Brought to you by the gardening crew at HGTV.